The transfer cables of the X1541 series are designed for transferring data betweeb PCs and Commodore 1541 disk drives. The X1541 cable is suitable for 286, 386 and 486 machines, the XE1541 and XM1541 cables are designed for Pentium/AMD class PCs with Starcommander or CBM4LINUX/CBM4WIN, respectively. 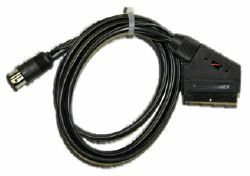 Serial cable for Commodore home computers and their peripheral devices, e.g. Commodore 64/128, VIC 20, Commodore 16, 116 and Plus/4, 1540/1541/1570/1571/1581 disk drives, and Commodore printers/plotters. Can be used everywhere in the peripheral daisy chain, possible connections are computer/drive, computer/printer, drive/drive, drive/printer and printer/printer. 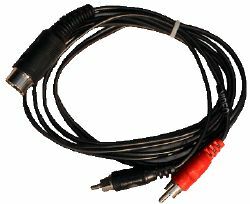 Standard monitor cable (composite video/audio) for Commodore 64/128, VIC 20, Commodore 16, 116 and Plus/4, Atari 800XL, Atari 130XE and other 8 bit Atari computers. 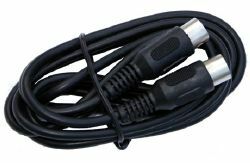 Monitor cable (Y/C, audio) for the Commodore 64/128. Please note that this cable requires a monitor that can cope with separate signals for Luma and Chroma. RGBI cable for the Commodore 128/128D (80 columns mode). Available with 8-pin DIN or 9-pin DSUB plug. RGBI and FBAS combo cable for the Commodore 128/128D, supports 40 and 80 columns mode (switchable). Please note that the 80 columns display is monochrome. Like C128 Combo Cable/SCART, but with Cinch connectors instead of SCART. 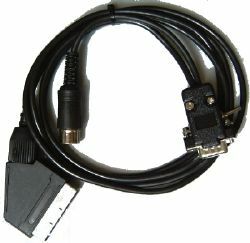 Monitor cable for the Commodore 64/128 with SCART plug, suitable for monitors and TVs with SCART connector. There are 14 variations of this product available, please make your choice from the product list.